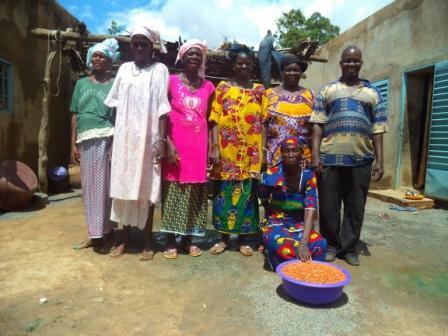 A loan of $1,175 helped a member to buy peanuts for resale. Aichata is the woman in the front holding the bowl of peanuts. She is a 41-year-old Malian businesswoman. She is married with three boys and two girls, who are between the ages of 3 months and 15 years old. She stocks up in her local market each week, then resells her products in nearby trade fairs. She earns at least 15,000 XOF per month. She is doing well, but in order to expand her business she needs more funds. Given her inability to raise this funding she is asking for a loan from Kiva partner RMCR in order to increase her earnings to pay for her family's needs. Translated from French by Kiva volunteer Kathleen Bertrand. View original language description. Aichata est la femme qui est devant la bassine remplis d’arachide. C’est une commerçante malienne âgée de 41 ans, mariée et mère de 5 enfants dont 3 garçons et 2 filles âgées de 3 mois à 15 ans. Elle s’approvisionne au marché de sa localité chaque semaine, ensuite elle revend ses produits dans les foires les plus proches. Elle gagne au moins 15000 FCFA comme revenu par mois. Elle s’en sort bien, mais pour élargir son activité commerciale elle a besoin de plus de fonds. Vu son incapacité de financement, elle demande un service financier (prêt) au RMCR Mali dans le but de pouvoir augmenter son bénéfice pour survenir aux besoins familiaux.